The Belmont Stakes: Final Run for Glory in the Triple Crown! 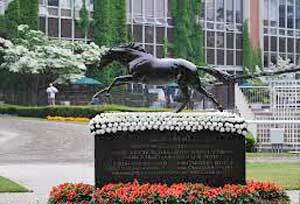 The Mighty Secretariat made history at Belmont and is feted each year with his own blanket of flowers. The Belmont Stakes, the final race in the Triple Crown of racing where history is sometimes, but not often made, and where Kentucky Derby and Preakness Stakes winners attempt to enter the revered racing history books. The track named “Big Sandy” by fans, owners and trainers is the longest dirt race track in North America and it challenges the best of the best. It is at here at Belmont Park race track in Elmont, New York that Triple Crown winners like Secretariat, Affirmed or Seattle Slew have made their mark, and remain the elite of racing. Others who challenged but failed, like Smarty-Jones and California Chrome, will never been forgotten as they came so achingly close to success three times over. The world wants another Triple Crown winner, another equine superstar, another powerhouse of a horse who can win once, then twice, and finally have enough stamina to win the third and most challenging race in the test! The Belmont Stakes, the oldest event in the Triple Crown, was named after a wealthy American banker and lover of horse racing August Belmont Sr. His son August Jr. was fortunate to inherit a large fortune from his father and was also a racing fan who went on to own the famous Man O’War. 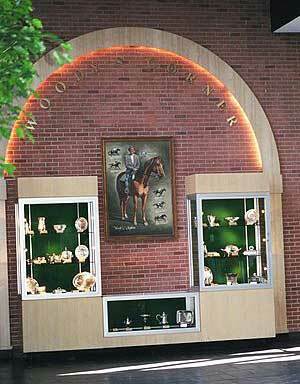 “Woody’s Corner” display at Belmont. The first Belmont Stakes were run in 1867 making it the oldest race in the esteemed Triple Crown with the Preakness first run in 1873, and the Kentucky Derby first run in 1875. A filly named Ruthless won the inaugural race at Jerome Park racecourse, one of just three fillies to have won the marathon race. Another filly Rags to Riches won the Belmont Stakes in 2007, and in1993 another filly Julie Krone, riding Colonial Affair was the first female jockey to win the Belmont. There are many ‘firsts’ that go hand in hand with this race including the first post parade in 1871 that saw horses walk by the crowds on their way to the starting gate, and the Belmont Stakes was the first race to be run in the counter clockwise direction. While the Kentucky Derby is the “Run for the Roses” and the Preakness winner sports a blanket of Viking Poms – and not the incorrectly thought and out-of-season Black Eyed Susans – the Carnation is front and centre at the Belmont Stakes. Made up of 400 carnations, the winner’s blanket weighs 40 pounds, and the florist also makes one for the statue of Secretariat for race day. 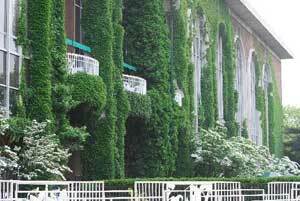 The ivy covered Belmont clubhouse. The Belmont Stakes is a mile and a half (2.4km) of tough struggle and of the 18 owners whose horses have seen victory in the Belmont Stakes more than once there were an incre¬dible 10 owners who can claim back to back walks to the winners circle. The last one was Meadow Stable, the owners of Riva Ridge in 1972, and Secretariat in 1973. The first was way back in 1871, 1872 and 1873 when Col. David McDaniel won three years in a row. In the training department, Woody Stevens trained five consecutive winners from 1982 to 1986 and the “Woody’s Corner” display commemorates this incredible achievement at the race track. There have been just 11 horses who can claim Triple Crown success. The last one was in 1978 when Affirmed ridden by Steve Cauthen won for Harbor View Farm. He was the youngest jockey to ever win the U. S. Triple Crown and he was named Sports Illustrated Sportsman of the Year. In the, “Almost Made It” category there are 23 horses who gave it their all and won the Kentucky Derby and then the Preakness only to fail in the final Belmont effort. Interestingly enough there were seven years when it was impossible to have a Triple Crown winner: In 1890, the Belmont and the Preakness races were held on the same day, and in 1917 and in 1922 the Kentucky Derby and the Preakness were on the same day. Between 1891 and 1893 the Preakness was not held and thanks to anti gambling laws the Belmont was not run in 1911 and 1912. Nobody beat Big Red! Secretariat is a legend and his win at the Belmont by an incredible 31 lengths saw him entered in ESPN’s 100 Greatest Athletes of the Twentieth century, the only non-human to make the list! No wonder there is a statue of him at Belmont racecourse where he made racing history! In 1887, 1888, 1892, 1910 and 1920, there were only two horses entered in the Belmont Stakes! Interested in placing a bet this year? The history books tell us that over 20 winners in the Belmont Stakes have come from the No.1 post position. If there is the possibility of a Triple Crown winner, the media comes from all over the world to get that one outstanding photo, or that quote to beat all quotes from the trainer, owner and jockey. In short, it can be a media frenzy!